After identifying and mapping potential greenspace, the CGIS analyzed, ranked, and prioritized potential greenspace polygons according to their impact on water quality, forestry resources, and greenspace system connectivity. In determining a potential parcel's impact on each parameter, the following assumptions were made. Water QualityPotential greenspace adjacent to water bodies, wetlands, and floodplains improves water quality by filtering runoff and nonpoint source pollution. Forestry ResourcesThe areal extent and type of forest cover are the values that contribute to an area's importance as a forestry resource. ConnectivityThe size of a greenspace and its proximity to parks, schools, and cemeteries are measures of its potential to become a link in a connected greenspace network. Using these assumptions, several analyses were performed to evaluate each potential greenspace polygon. For example, when evaluating a polygon for water quality, five analyses were performed and scored. The scores from these analyses are added together and averaged to produce a total water quality score. The forestry and connectivity parameters were tested in a similar manner. Total scores for each parameter were added together and averaged, generating a final ranking and prioritization score for each potential greenspace polygon. The lowest score indicates a polygon with the highest priority for acquisition. Simple proximity and containment analyses in ArcView 3.3 were used to score the potential greenspace polygons for water quality and connectivity. The connectivity analyses also queried potential greenspace polygons based on polygon size. Forest quality analysis considered the amount and type of forest cover. Clipping the 20 DOQQs to the potential greenspace boundary using Leica Geosystems IMAGINE software eliminated developed areas from the images. This reduced the work associated with the next step-image classification. Multispectral image classification groups pixels in an image into classes (e.g., agriculture, forest, water) based on their value and location in the electromagnetic spectrum. Supervised classification was performed on each of the original 20 clipped DOQQ images. In a supervised classification, the identity and location of some of the land cover types, such as wetlands, roads, and forests, are known so the image interpreter evaluates these known land cover types and then assigns pixels to the class based on similarity to these known types. Using published map files (PMFs) in conjunction with ArcReader allowed users to view ranking, prioritization, and ownership information for potential greenspace polygons. A summary function produces cross-tabulation statistics that compare class value areas between two thematic files including number of points in common, number of acres (or hectares or square miles) in common, and percentages. The supervised classification of the Atlanta image and the potential greenspace layer resulted in the formation of eight classes: evergreen, deciduous, hardwoods, shrub, grasses, water, exposed earth, and shadow. Of the eight classes, evergreen and deciduous forest were the most relevant. The classified images were mosaicked and overlaid with the potential greenspace layer, and a summary function was performed that broke down image classes by their associated polygons in the greenspace layer. This information was placed in a spreadsheet and used to calculate various classification statistics for each potential greenspace polygon. The spreadsheet was then joined back to the potential greenspace shapefile so results could be viewed graphically. Results of the forestry analysis were used to rank potential greenspace polygons based on amount and type of forest cover. After prioritizing the polygons, a new GIS layer was created by intersecting the potential greenspace layer with parcel data joined to tax assessor information. The intersect layer allowed CGIS to do three things. Calculate the value of potential greenspace by parcel using area-weighted analysis. Identify the number and owners of parcels touching the potential greenspace. Produce a spreadsheet that lists all potential greenspace parcels and their associated ranking scores, value, and owners. Phase I identified 379 potential greenspace areas that comprised more than 12,000 parcels inside the city of Atlanta, ranging in size from 5 to 512 acres. These areas totaled more than 14,000 acres and had an appraised value of more than a half billion dollars. Located primarily along stream corridors, these potential greenspace areas represent approximately 16.6 percent of the city's total area. Currently, the city's parks make up only about 3.5 percent of the city's area. Phase II identified 756 potential greenspace areas consisting of more than 23,000 parcels inside the perimeter demarcated by Interstate 285. These areas ranged in size from 5 acres to 376 acres, totaled almost 20,000 acres, and had an appraised value of almost $1.5 billion. Although these potential greenspace areas were also found primarily along stream corridors, large residential backyards also constituted a sizable portion of the potential greenspace in certain parts of the study area. In this study area, potential greenspace represents approximately 12.5 percent of the total area while existing Metro Atlanta parks comprise approximately 10 percent. The potential greenspace parcels and their associated tax and ownership information generated by Phase I and Phase II were ranked and prioritized by impact on water quality, forestry resources, and greenspace system connectivity and stored in a Microsoft Access database. This database has unique identifiers for parcels and potential greenspace polygons that allow tables to be joined to either GIS dataset to view the results spatially and create thematic maps for displaying information such as the number of parcels per potential greenspace polygon or the appraised value of potential greenspace. While the results of the Greenspace Acquisition Support System are useful to several local agencies, many of these agencies do not have the necessary GIS capabilities or expertise to interpret them. To address this dilemma, the CGIS created The Interactive Mapper, an HTML-based program, as part of Phase I. This program allows users to view identified potential greenspaces, greenspace analyses rankings, and prioritization scores as well as print maps, view ranking and prioritization criteria, and inspect tables containing potential greenspace analyses scores. Because this program is relatively small (15 MB), it can be published over the Internet or viewed locally on any computer with a Web browser. As part of Phase II, the CGIS employed ArcReader in conjunction with published map files (PMFs) created using the ArcGIS ArcPublisher extension. 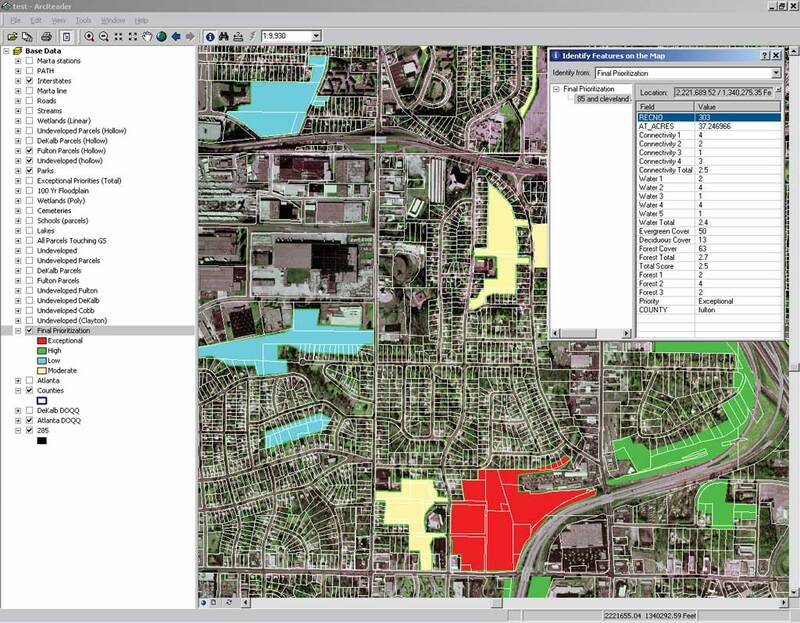 This allowed CGIS to deliver all GIS data and results, including aerial imagery, in a format that gave users improved access to maps and potential greenspace information and the ability to query and print maps. The CGIS provided information on using ArcReader to Trees Atlanta and other local agencies, which lets them use study results for targeting land for acquisition. The CGIS delivered the GIS data and PMFs to Trees Atlanta and other local agencies on a single CD-ROM. CGIS completed Phases I and II of the Greenspace Acquisition Support System in 2001 and 2003, respectively. The results of these two phases are currently being used by DeKalb County, Trees Atlanta, and The Trust for Public Land. According to Kevin Johnson, project manager with The Trust for Public Land, having a GIS-based comprehensive inventory of Atlanta's remaining greenspaces in a convenient format "has proven to be a great supplement to our current greenspace preservation efforts by solidifying the importance of our current acquisitions as well as providing us with future targets for greenspace preservation. It has also made us more aware of the necessity to act quickly." The Greenspace Acquisition Support System is a model for other Georgia counties and municipalities. It demonstrates the importance of using GIS for greenspace identification, prioritization, and acquisition. The CGIS intends to focus Phase III efforts in DeKalb County to identify and prioritize lands located outside the perimeter formed by Interstate 285.